The traditional aspects of the Christmas tree of today come mainly from Germanic and Scandinavian origins. Christmas as we've come to know it is like other Christian festivals, a mixture of traditions brought together from a variety of backgrounds to satisfy all under Rome ! Those various traditions each had their own enlightenment rituals which became symbolized; over time we've forgotten the meaning of the symbols, but like most other hidden knowledge it is right under our noses. In Finland, the Shamans, and one in particular called Hold Nickar, are known to have worn red suits with white spots to pick the sacred Amanita Muscaria or Fly Agaric mushrooms, which are themselves red with white spots. On returning home from picking, on reindeer sleighs, they had their mushrooms in a sack, and re entered their lodges through the smoke hole in the roof ! Hold Nickar and friends ate those mushrooms to enter the Christ Consciousness, that's how he became Saint Nickar, or Saint Nicholas as we now know him ! The reindeer also ate the mushrooms, which is why they are characterized as flying, although this ties in with other older legends of gods flying the skies at night once a year giving gifts to the worthy. 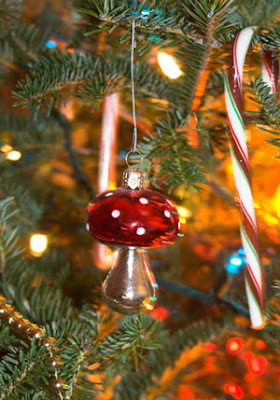 In German and Norse traditions it was normal to hang the dried Amanitas on the Christmas tree for decoration; but there is another relationship between the Amanita and the Christmas tree in that the Amanita's mycelium (roots) can only grow in the root zone of certain trees; just about anything you could call a Christmas tree is suitable although Birch are also good. That is why we have a decorated Pine or some such tree at Christmas. One of the earliest natural decorations used were dried Amanitas ! One other thing about Pines is the pine cone which represents the Pineal gland which is situated centrally in the brain, and looks just like a little pine cone. It is the activation by the Amanita of the pineal gland, that opens the internal inter-dimensional stargate that allows us to travel as consciousness to other very real dimensions, resulting in what could be considered the enlightenment of the Shaman ! You can often see the Pope dressed in white with a red cape to represent the Amanita Muscaria, or sometimes in all white with a little white cap, to represent the Psilocybin or Liberty Cap magic mushroom. A lot of traditions use entheogens ( teacher drugs) to enter an enlightened state, Christianity is based on entheogen use amongst other enlightenment practices. There is an enormous pine cone on a plinth at the Vatican to represent the pineal gland; Roman Catholicism is in part a mushroom cult that hasn't bothered to tell its members ! When in times gone by a man with flying reindeer, and dressed in red suit with white spots (buttons) entered your lodge, through the smoke hole in the roof, to bring a present from his sack, he was bringing the gift of enlightenment by activation of the pineal gland, which is represented by adding pine cones to the tree's decorations to symbolize that gland, which then hang on the tree alongside the dried mushroom that activates it. The Star on top of the tree represents enlightenment itself ! Glenn Bullock, is a 44-year-old Derby, England welder, married, and father of three sons. He has been researching ancient and modern NWO related symbolism full time for the last four years, and is hoping to publish a book some day ! Glenn's YouTube about Occult Symbolism in his home town. See also "Santa Claus and the Magic Mushroom"